Thai is one of my favourite Asian cuisines. Believe it or not, there were no Thai restaurants in Milan, at least up until 6 years ago! Some Chinese restaurants would serve some Thai dishes, but they obviously did not have a lot of variety. That’s why, the moment I saw it, I bought this little book about Thai cuisine that I have almost learnt by heart! The recipe I want to share with you today is very easy and it is family approved, which means that even my 2 little ones like it. 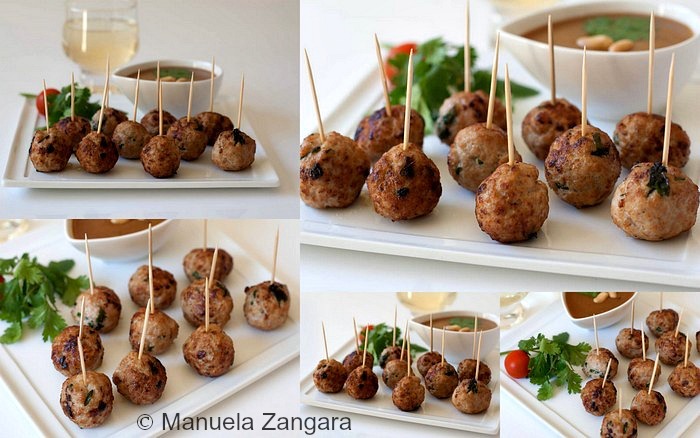 You can serve these meatballs as a main dish or as an appetiser (better if made slightly smaller than regular meatballs) and are great for a buffet. You can also make the peanut sauce to go with them in a matter of minutes. I am not saying this is an original recipe, but it tastes great and I am all for delicious recipes that are very fast to make and please my fussy eaters! 😉 I make them with pork mince, but I am sure these would also work with chicken, beef or veal mince! Enjoy! 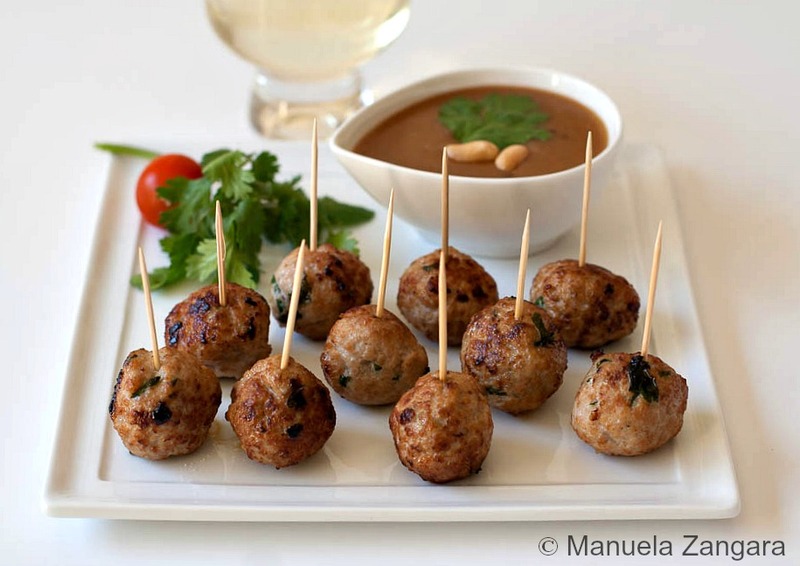 How to make Thai inspired Pork Meatballs with Peanut Sauce. 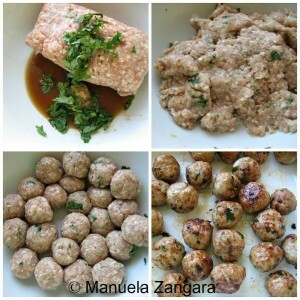 To make the pork meatballs, put the minced meat, garlic paste, chopped coriander and fish sauce in a big bowl. Knead well and make balls the size of a walnut. Keep them aside. In the meantime, prepare the peanut sauce. Put the vegetable oil, garlic and ginger pastes and the chopped chilly in a small pot and sauté for a minute. Add the peanut butter, fish sauce, brown sugar and coconut cream. Mix well and cook on a low flame for a few minutes, or until it thickens. Add the remaining chopped coriander, mix and put the fire off. Fry the meatballs in hot vegetable oil for a few minutes. When cooked through, put them on a plate covered with kitchen paper to drain the excess oil. 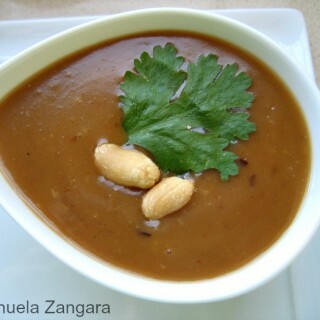 Serve them warm with the peanut sauce on the side. 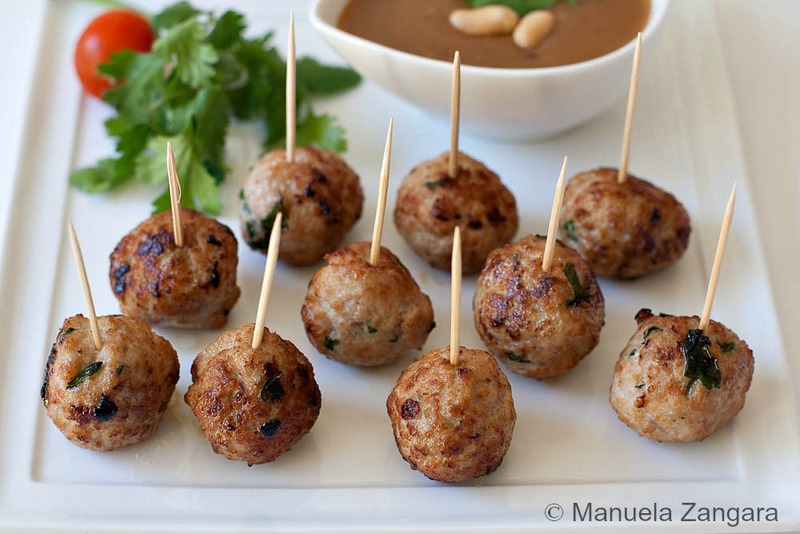 [Laughter] Have never had porkball satay before: what fun, and they look so appetizing 🙂 ! It might not be original but it’s great to be reminded of some good classic meals every now and then. When I lived in Torino, there were no ethnic restaurants at all. I guess even Italy is starting to realize that some other cuisines are worth looking at. I love Thai food. Now there are a quite a few Thai restaurants (a couple I think have existed for about a decade because I remember going there before having my first child), and a handful are actually very good. But it is still a sort of niche cuisine, not something you go out and stuff yourself with at the local hangout. Thai is one of my favorite cuisines.